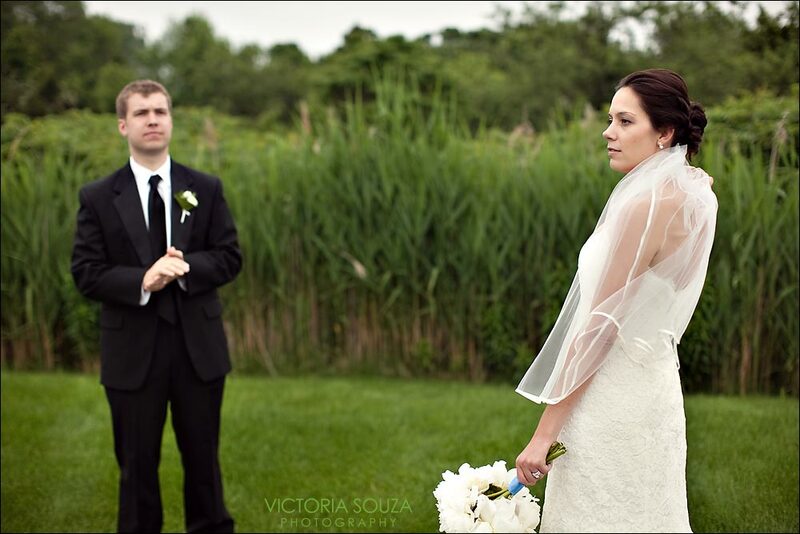 The rain pittered and pattered on and off on Kara and Andrew's June wedding day. You would never know from the smiles, the laughter, the love, and friendship, that surrounded this couple and their fantastic wedding! When I first met Kara, back in January, she had so many ideas and so many fun details to incorporate into their wedding day. She wanted to ensure that it all came to life, and reflected their personalities, while looking cohesive, tasteful and fresh. 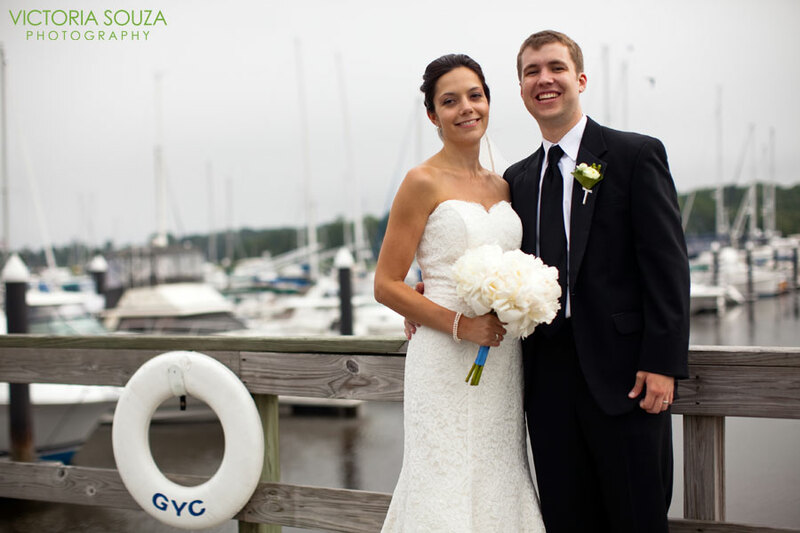 We loved it all and the crisp and neutral palette of the Guilford Yacht Club couldn't have been a better place to see it happen! 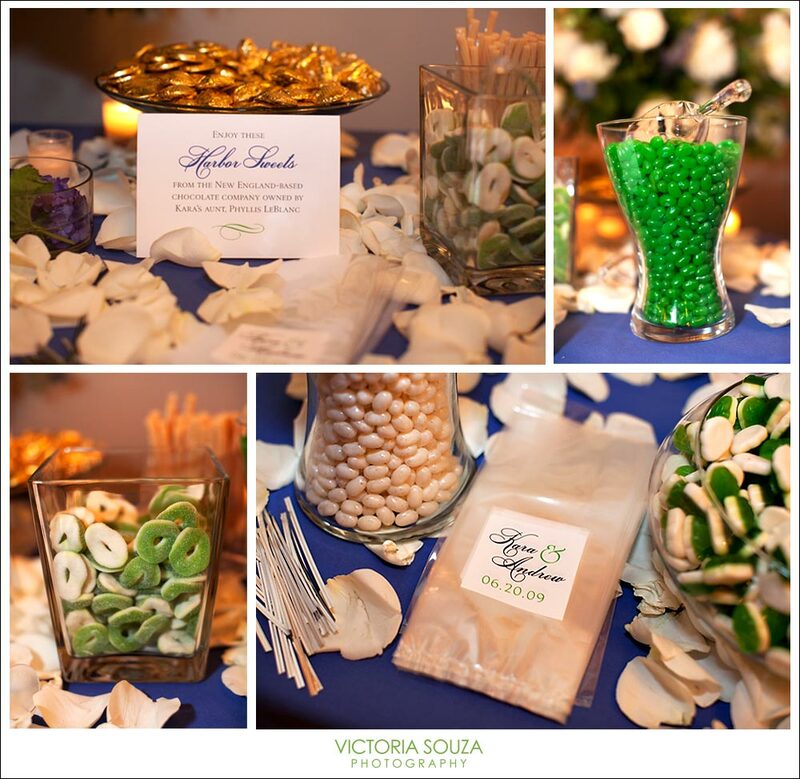 Thanks to Vicki Souza Photography for all of the fabulous pictures! Kara and the girls started their day at the Chameleon Salon in New Haven for their hair and make-up. 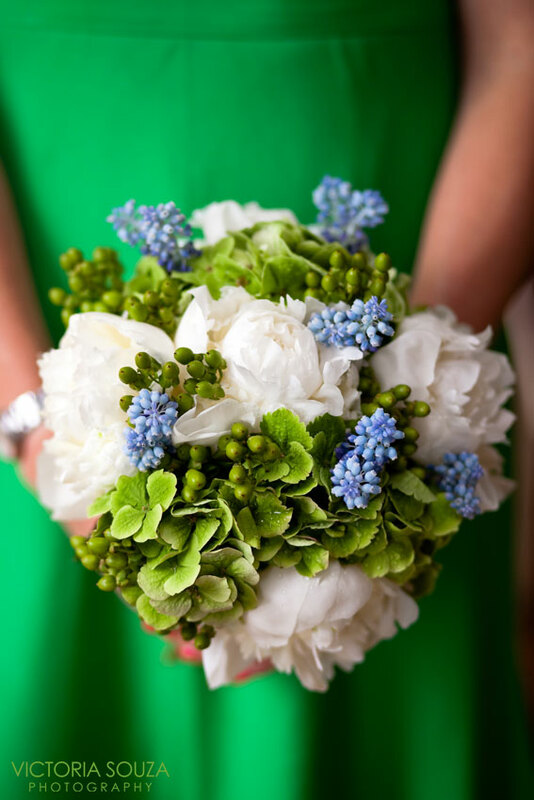 I met up with them back at the Omni Hotel, just as the beautiful bouquets were being delivered by Elisabeth from Studio Blush Floral and Kara was stepping into her stunning lace gown by Vineyard. The girls wore Kelly Green Sophia dresses from J. Crew. We found a great spot outside of the second floor ballroom for some inside formal pictures and they came out so cool. I made my way over to the First Congregational Church in Guilford for the ceremony, greeted Andrew and the groomsmen and assisted with handing our programs. 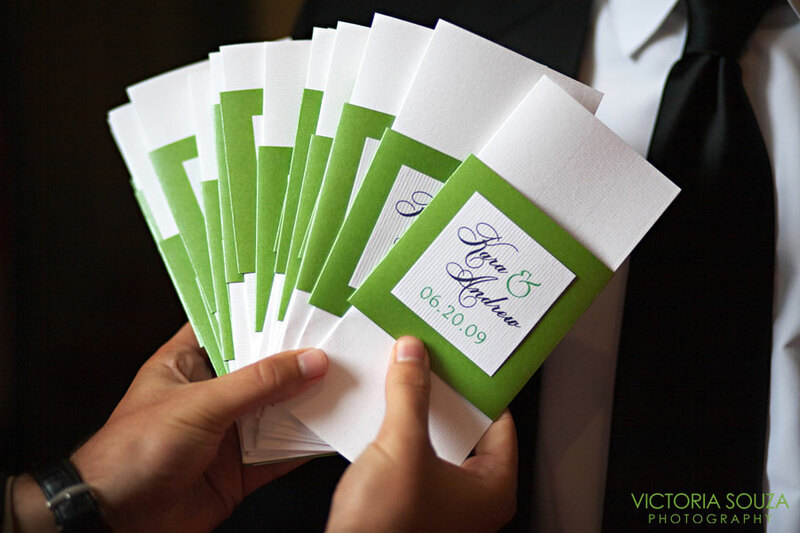 All of Kara and Andrew's wedding day stationary was designed by Ashley at Smashing Cards and printed, cut and assembled by Sixpence. 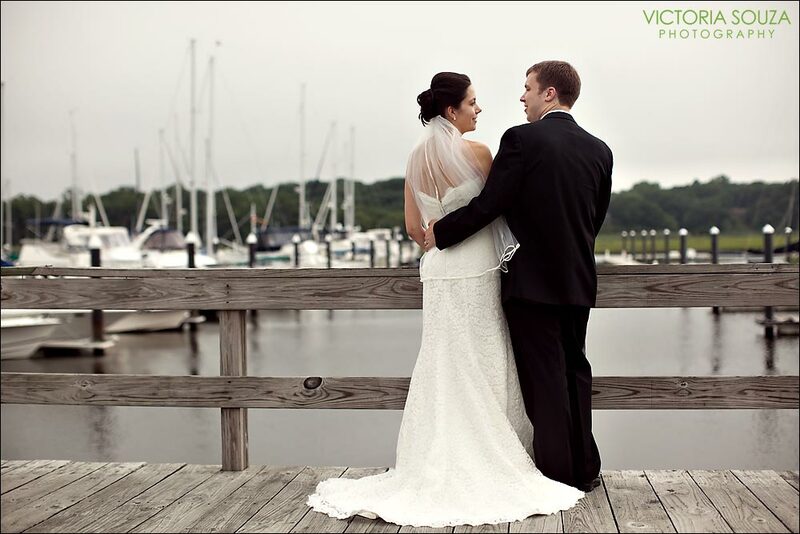 The ceremony ended with a dramatic kiss, clearly these two were thrilled to be married and guests began their exit towards the Guilford Yacht Club for the reception! 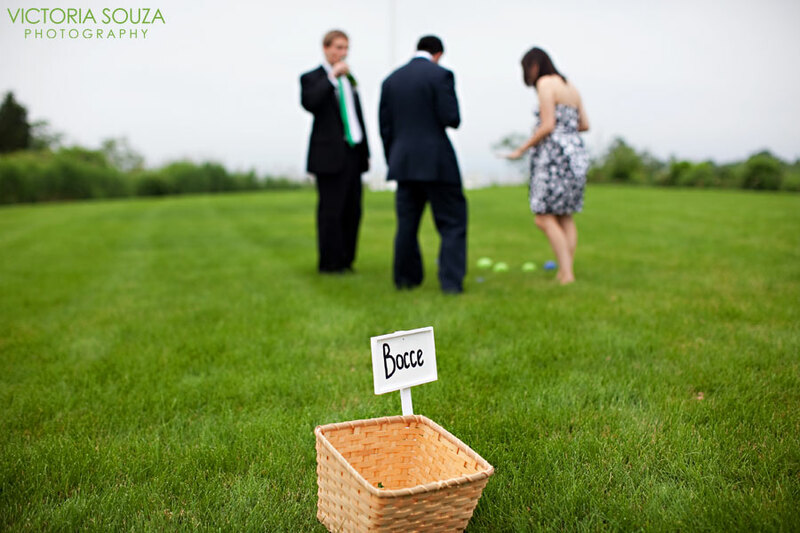 The original plan of cocktails and hors d'oeuvres on the lawn didn't quite work out, but it didn't stop a few from playing a fun round of bocce. 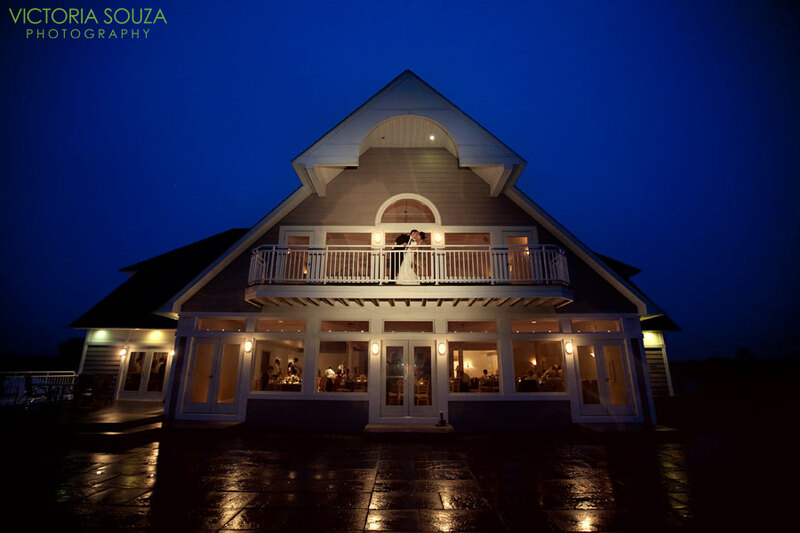 The rain let up, the sun almost popped out, and Vicki was able to capture some stunning moments of the newlyweds. Inside, while guests enjoyed the cocktail hour upstairs, the reception space lay waiting. Everything came together exactly as expected. 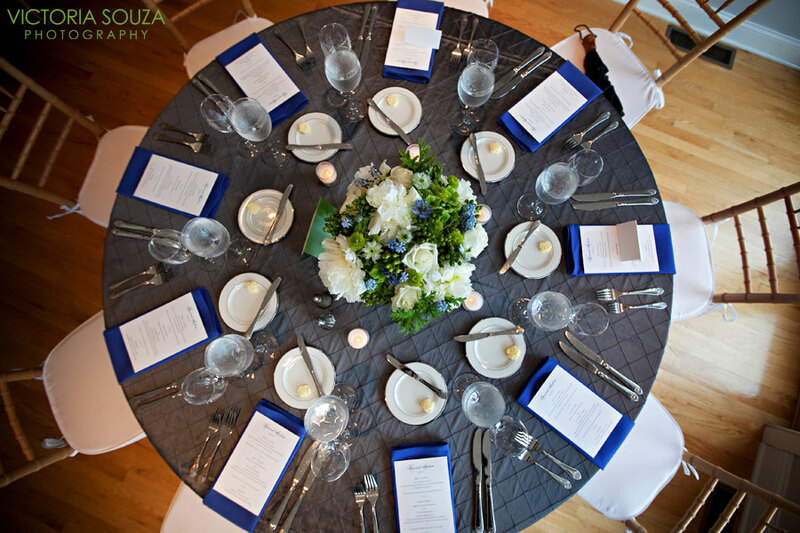 The steel gray pintuck linens, the rich cobalt blue napkins, the bright green touches in the centerpieces all looked fantastic together. 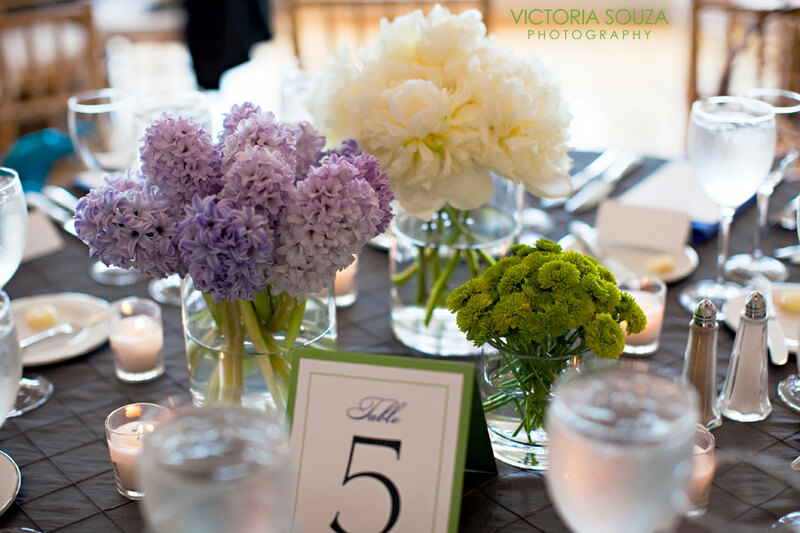 We finished off the table decor with stationary items - menus and table numbers. 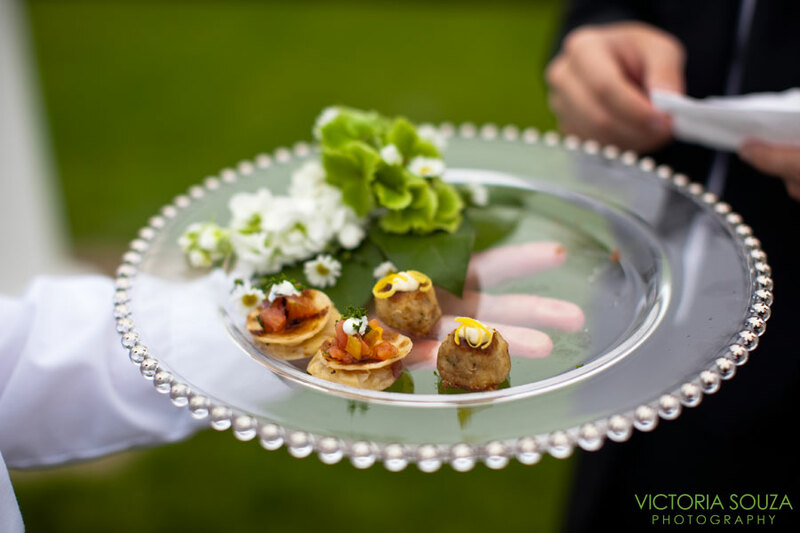 In addition, Marissa and her staff from Jordan Caterers are always excellent to work with and this day was no different! Guests raved of the food and the service. Powerstation Events offered the entertainment, with a string duo for the cocktail hour and Jon for the evening DJ. We had some fun introductions of the bridal party, then Kara and Andrew were introduced and shared their first dance as husband and wife to Crazy Love, by Van Morrison. One of my all time favs! 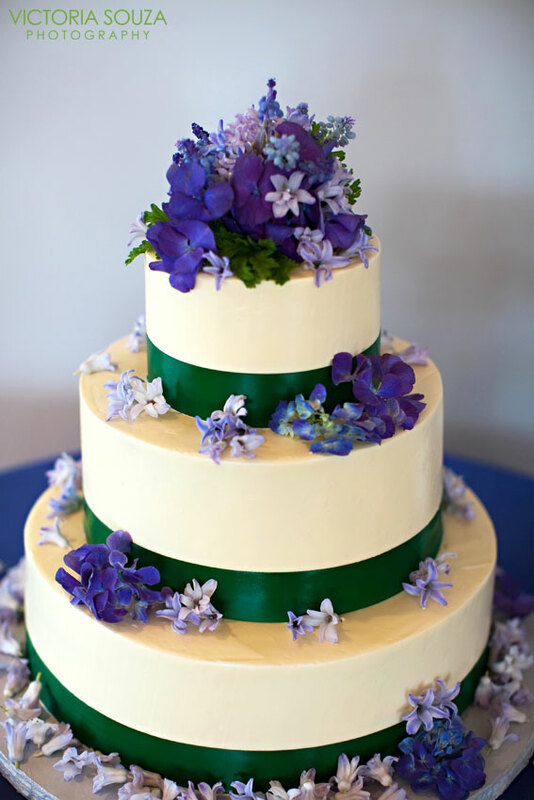 Later in the evening, Kara and Andrew cut their beautiful cake, provided by J.Cakes and gave warm and touching thank yous to their families for making such an incredible wedding possible. They followed this with a bouquet toss to all the single ladies from the second floor balcony and an evening of fun and dancing! 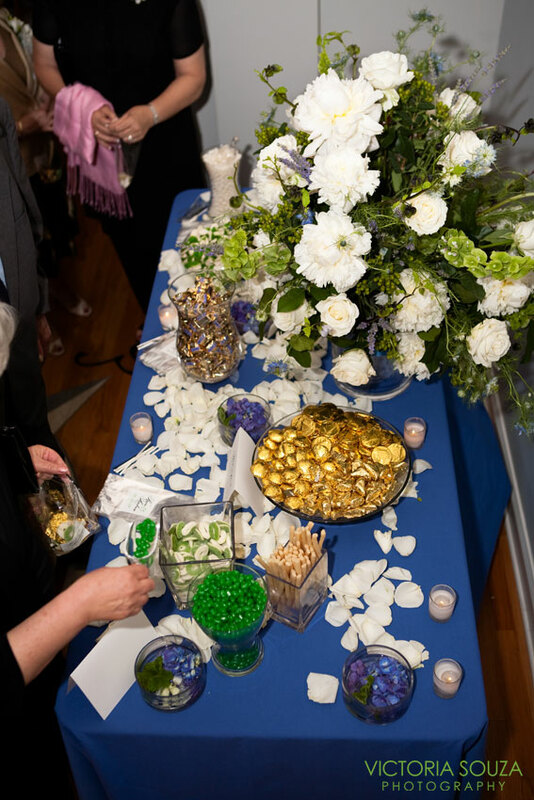 We couldn't end the evening without a candy bar in wedding colored goodies, and handmade chocolates from Kara's aunt at Harbor Sweets. Yum! The candy bar was a major hit! 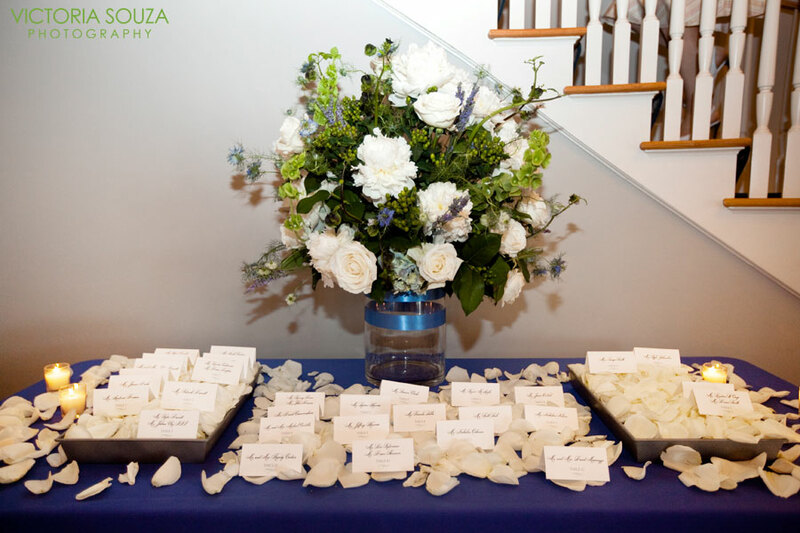 Kara and Andrew, we had so much fun working with you to make your wedding day so special. We wish you lots of love and happiness in the years to come. Thank you both so much for making a fabulous wedding so easy to photograph with your expert focus and amazing details! Not only are you both fun to work with, you also made the day flow effortlessly. Thank you so much for making our day such a success!!! 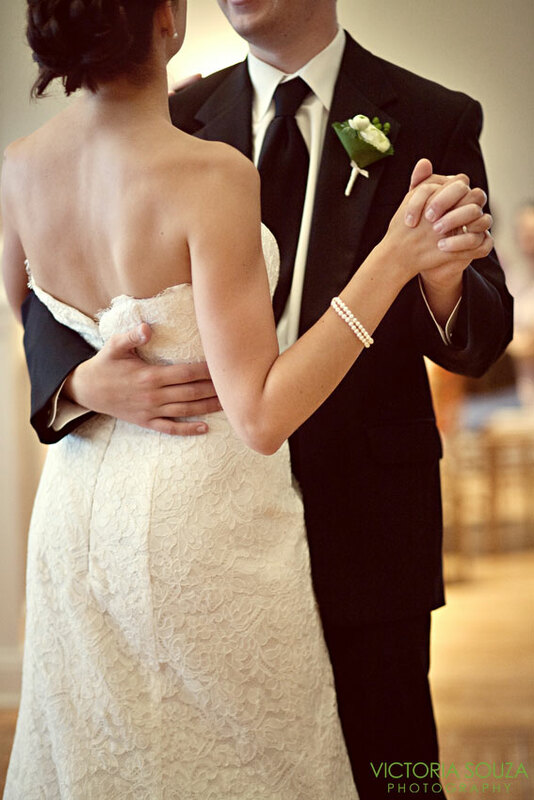 Your expertise made all the difference in our wedding. Looks like it was a great wedding. The last image is stunning!